The most popular commercial bathroom lavatory system we sell is the Bradley Terreon® Imperial Wall-Mount Lavatory. This system is popular for a number of reasons. Among the most important of these reasons is its ADA, ANSI, AND UFAS compliant design. Architects designing multi-use facilities frequented by handicapped persons can ensure accessibility and comfort for these persons. The Imperial Wall-Mount is also vandal resistant, making it a better alternative to china lavatories which can be broken by vandals. Terreon is a solid surface material consisting of polyester resin, bio-based resin, and preconsumer granules. It is resistant to stains, burns, and impacts. If it is ever damaged, it is easy and cost-effective to repair with normal maintenance tools. Other Bradley lavatories feature a broad range of benefits that will specifically address the needs of architects and plumbing companies to supply a product that is user friendly, environmentally sound, and ergonomic in nature. Space utilization is a major consideration in today’s building industry. Restroom space is not exempt from the need to make the most of every square foot. Bradley commercial bathroom lavatory systems are typically smaller than competing models. At the same time, they have demonstrated superior performance that makes them a much better choice than larger, less efficient models. Cleaning and maintenance are easier, and repairs can be made more quickly due to the superior grade materials from which these sinks are manufactured. Ergonomics is another important feature of Bradley commercial bathroom lavatory systems. Everything from stainless soap dispensers to photovoltaic technology is available in our online selection. Photovoltaic sensors detect movement beneath the faucet and activate the water stream. The user never has to touch the fixture. This minimizes the passing of pathogens between users, thus improving the health and welfare of employees and visitors to the site. Furthermore, the reduction in waste water makes photovoltaic sinks the most environmentally sound choice that plumbing companies can add to their invoices. Any organization that is seeking to improve its green image will see a clear advantage in advertising a line item that is dedicated to conservation of water resources. Photovoltaic cells do not require batteries or electrical wires to operate. They convert light directly to energy and store it until it is needed for use. User friendliness is another important consideration for architects and plumbing companies to take into account when designing a restroom. From a utilitarian perspective, the functionality of commercial bathroom lavatory systems is only beneficial when the lavatory itself is accessible and comfortable. Many new laws also require that all washroom facilities be fully accessible to disabled persons. Some models offer water flow controls that allow the user to choose the manner in which they utilize the sink. Control options range from infrared hand movement detection, to push button air valve, to electronic push button activation. Lavatories shut the water off automatically 30-45 seconds after use. Bradley commercial bathroom lavatory systems are fully compliant with all ADA (Americans with Disabilities Act), OSHA (Occupational Safety and Health Administration) codes, and TSA (Travelers Security Administration) requirements for travelers with disabilities. Both single and multi-user stations are available to accommodate any size organization or facility type. We offer Commercial Bathroom Three Compartment Hand Wash Sinks as well as other commercial bathroom products at factory direct pricing. 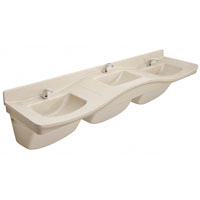 Commercial three compartment sinks are ideal for saving wall space and servicing multiple users at once. New materials make them easier to clean and more impact resistant than ever before. 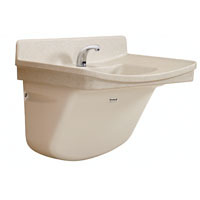 We offer our sinks at factory direct pricing. ADA lavatory systems for handicapped bathrooms must comply with strict federal guidelines that mandate specific dimensions to ensure comfortable, safe operability of sinks by physically challenged persons. 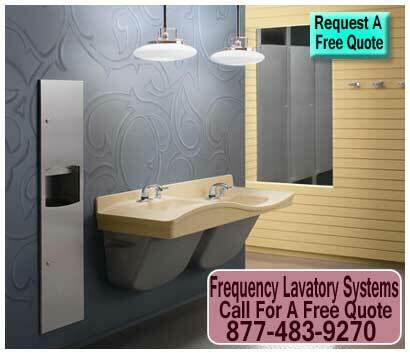 Come let us help you with you lavatory needs factory direct contractor pricing. New lines of custom, unique, modern quartz double trough bathroom lavatories and sinks have recently emerged that take commercial restroom design to a whole new level of form. Come check our prices. 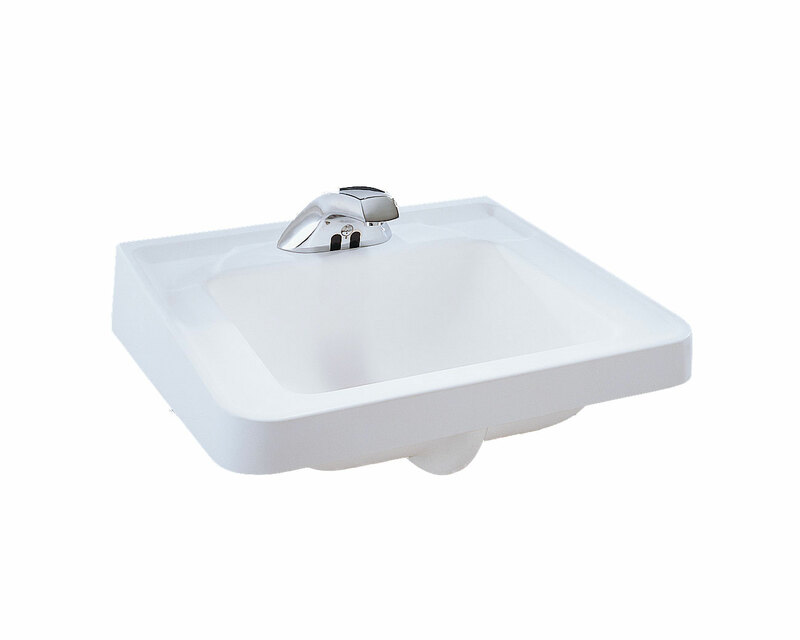 Our wall mount lavatory hand washing sinks offer a litany of unique designs and high grade materials. We offer factory direct discount contractor picing. The Verge® Bradley lavatory single user hand washing station is a GREENGUARD certified single user hand washing system optimized for high-end, modern and eclectic, contemporary restroom design. We carry a large supply of lavatories at factory discount prices. 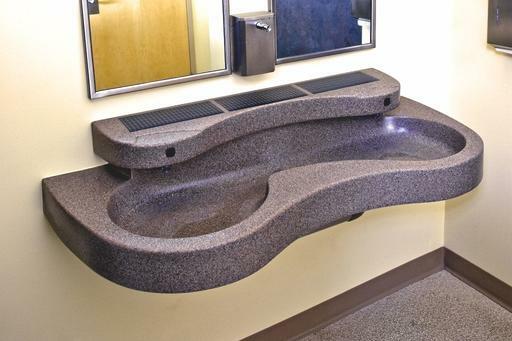 Terreon® commercial sinks are ideal for every type of factory restroom design. We offer factory direct discount pricing. ADA compliance is the most important consideration in hotel design. Persons from all walks of life will be visiting the hotel. We can help you with your commercial restroom needs at an affordable price. Any organization that invests in commercial stainless steel sinks can expect to save money on future replacements. We offer stainless steel sinks at factory direct prices. Bradley commercial lavatories and sinks feature a wide range of ergonomic designs and material builds that comprehensively address the needs of plumbing companies and the many clients we service.